1 2 3 4 5 Click to share your rating 8 ratings (5.0/5.0 average) Thanks for your vote! 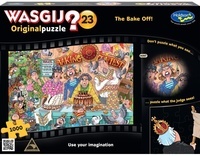 22.61% of people buy Wasgij: Original - The Bake Off 1000pce Puzzle and Wasgij: Destiny - Shopping Shake Up! 1000pce Puzzle. "WASGIJ puzzles are the best." Just love WASGIJ puzzles. They challenge the mind and the colours of the puzzles are lovely and bright plus the cut of the puzzles is perfect. Good quality jigsaw with a twist – the picture on the box is not the view shown by the completed puzzle, it's just a clue to it. "Best challenge I've had in a long time." The best mind game I've had in ages. Challenging, fun and a real surprise once completed. Loved every minute of it! At the Country Fair, the baking competition is hotting up! The judges have high expectations, but what sweet surprises will be offered by the contestants? The puzzle holds the answer! The picture on the box lid is not the puzzle; it is simply a clue to what the puzzle is! Suitable for ages 5 & up.